Offers.com has been in business for about 6 years, half of which it was using the web address as its company name after acquiring the domain name, and has managed to achieve profitability in a field that’s becoming more saturated every day: online offers and coupons. The company now runs a profitable web-based operation with 30 employees without raising a dime of external capital, so it’s time to take a look at what they’re doing. Offers.com is a place where anyone (well, anyone located in the U.S.) can go to find and compare great online deals across a wide range of categories like travel, food, printed media, insurances and virtually every web retailer out there. It doesn’t require people to register to be able to use, which is a big plus. It relies on retailers to provide information about current promotions, although it has a team in place that checks everything that comes in and also does some editorial work to make the website more attractive to visit. The site is pretty straightforward: you can search for offers on items that you’d consider purchasing, and the service will take you to the location where you can redeem a code or coupon associated with whatever deal you find. You can also alert others to the offer at hand by e-mail a link or posting a message on Twitter. Today, the company is launching a new feature that should make it easier for people to keep tabs on specific offers, retailers or entire categories of items. 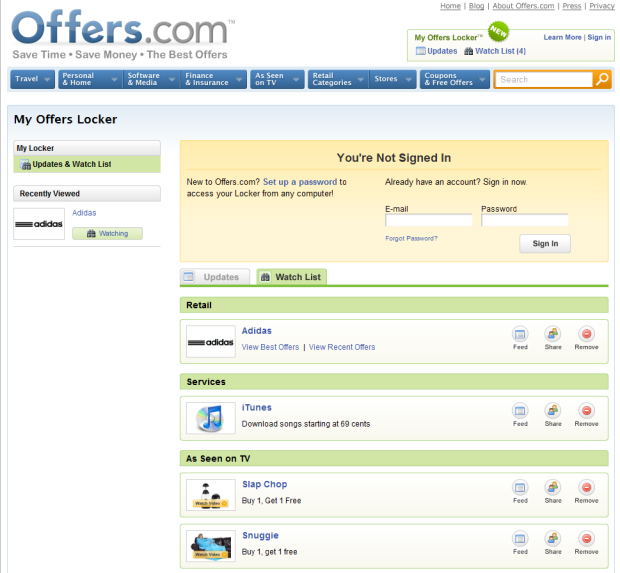 Dubbed the ‘Locker’, it’s essentially a sort of ‘Offers.com My Account’ with a slightly sexier name. Using a ‘watch this’ button next to specific offers, stores or categories, you can place what’s interesting to you on a so-called Watch List. That way, you can for instance obtain a feed of new offers from the Apple Store or get updated on when there’s a promotion on that Power Juicer you’ve always wanted. You can also view the feeds for all your watched items separately and share them with others via Twitter, Facebook or by simply e-mailing a link. Again, you don’t even need to register to use the Offers.com Locker, although you might want to if you’d like to receive updates via e-mail and not lose your data when you clear your cookies or change computers. If you’re a Firefox user, an alternative to e-mail notifications is this handy add-on, which will alert you when offers are available on the website you’re browsing. Offers.com, which also owns another killer domain with Offer.com, faces competition from many websites aggregating local offers for retailers or aggregating deals from other sources. Other companies it’s battling with include Savings.com and Coupons.com.